Aiming to reduce pollution, the state of California recently enacted the first law in the country that bans the use of single-use plastic bags in grocery stores. 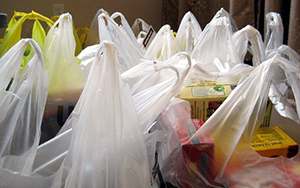 On July 1, 2015, California’s law will prohibit grocery stores and pharmacies from distributing these plastic bags. The law will also require stores to charge customers who use paper or compostable bags a 10-cent fee. While environmentalists support this ban, organizations like the American Progressive Bag Alliance and the Retail Merchants Association are against it. These organizations claim that this law will raise costs for businesses. They also argue that some store employees may resist explaining to customers why they have to pay for something that used to be free. Though California will be the first state to ban plastic bags, individual cities in California have already prohibited them. San Francisco, for example, passed an ordinance against single-use bags back in 2007. Some cities outside of California have taken similar actions. In 2010 for instance, Washington D.C. imposed a five-cent charge on customers who use plastic bags.